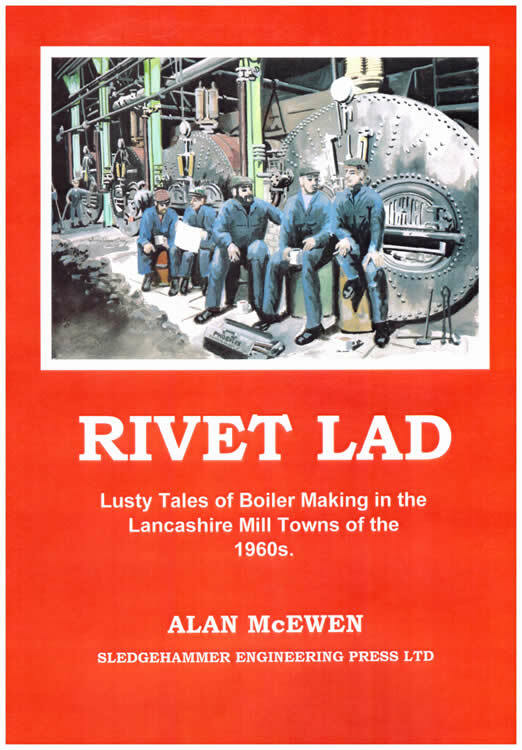 RIVET LAD – Lusty Tales of Boiler Making in the Lancashire Mill Towns of the 1960s. Alan’s book, written in his own inimitable style takes the reader back to the exciting days of the 1960s when he was the youngest member of Carrot Crampthorn’s Squad of Boiler Makers working on heavy structural repairs on Lancashire and Cornish Boilers, a Cochran Vertical Boiler, a Stationary Locomotive Boiler, a huge steam Accumulator converted from a Lancashire Boiler and much more. The book’s larger-than-life characters, the hard as nails, ale-supping, chain-smoking Boiler Makers: Carrot Crampthorn, Reuben Ramsbottom, Teddy Tulip, Paddy O’Boyle, and not least Alan himself are, to a man, throw-backs to times gone by when British industry was the envy of the world. Overseas customers contact Sledgehammer email for postage costs. Sledgehammer Engineering Press Ltd produce wonderful books that are steeped in industrial history. I’ve just received my copy of RIVET LAD and I must say that I haven’t been able to put it down, I’ve been learning all about the tales of Carrot Crampthorn’s Squad and the places they have worked. Alan and. 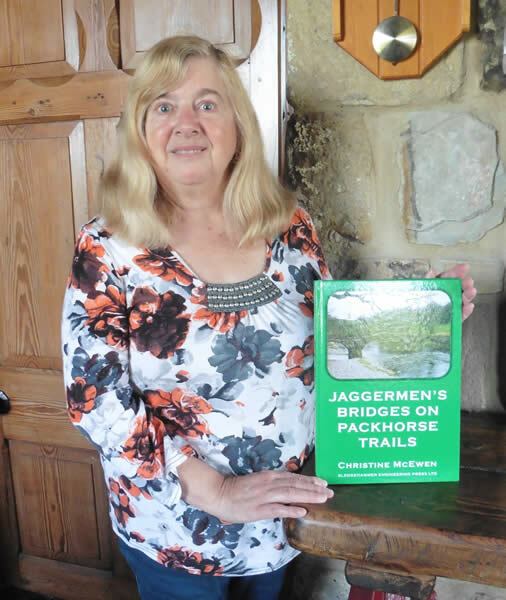 Christine are very knowledgeable in industrial history which shines through in all their publications. 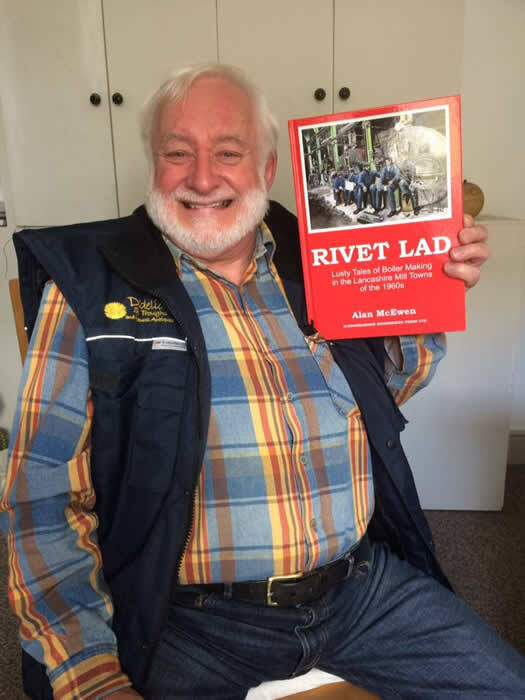 In his new book ‘RIVET LAD’, Alan McEwen’s boundless enthusiasm for the topic shines through brighter than a white-hot rivet! In his eloquent, narrative style, Alan takes the reader on a fascinating journey back to the 1960’s where he delves into the smoky, grimy and thoroughly hard graft working life of a young and enthusiastic Boiler Maker to bring the reader, not only a highly entertaining, but very accurate historical accounts, and gritty down-to-earth perspective of life in a busy boiler repair squad. Alan is not only a Master Boiler Maker, but is also a well-acclaimed published author and a highly respected industrial historian which enables him to fill each chapter with scenes and colourful quotes that lend themselves to successfully offer first-hand accounts, and a deep working insight, into a little known or understood facet of the north of England’s once glorious industrial past, while at the same time bringing back to life memory-provoking scenes of a young fresh faced ‘RIVET LAD’ quickly coming to terms with life in the harsh environment of hard men and working in Lancashire cotton mill and factory boiler houses. I highly commend this top quality, excellently produced publication to anyone whose interests include traditional steam boilers, industrial history or, just want to sit down and enjoy a ‘reet good read’ as Alan would say. Since his retirement from boilermaking, Alan McEwen has been busy researching and writing books in his own inimitable style, and this is his latest one. Subtitled: ‘Lusty Tales of Boiler Making in the Lancashire Mill Towns of the 1960s.’ the book takes us back to a time when Alan was the youngest member of Carrot Crampthorn’s Squad of Boiler Makers, undertaking structural repairs to Lancashire and Cornish boilers, and more, all heavy work. However, with the exception of the author, all the characters in the book are fictitious though the story line is clearly drawn on Alan’s experiences over his time as a boilermaker. The cover illustration of the ‘Squad’ is by Jonathan Clay, while the majority of the 13 chapters is headed by a drawing by Lydia Holdsworth. The chapters carry interesting titles, for example: Billy Bagshaw’s Cream Life Carbolic Soap Works Job; Obediah Blackroot’s Owl Gob Blanket Mills Job, while the book is written in ‘Lancashire Twang’, though, luckily there is a glossary to help others translate. 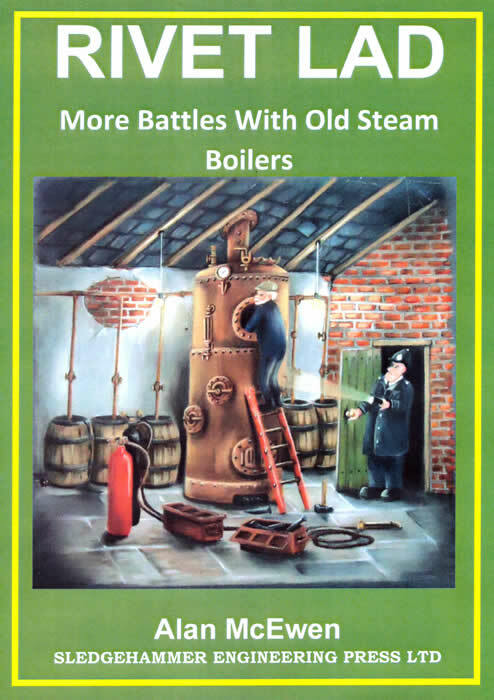 Although the characters are fictional, the illustrations are drawn from Alan’s extensive archive and are fine examples of industrial boilers and the boilermaker’s art. Sadly, these magnificent boilers of a past age have mainly been replaced by modern package boilers; yes, much more efficient but less romantic. RIVET LAD – SUBTITLED: Lusty Tales of Boiler Making in the Lancashire Mill Towns of the 1960s. This period may only be fifty to sixty years ago but was a world away from what we have today. Alan takes us back to his days as the youngest member of ‘Carrot Crampthorn’s Squad of boilermakers working on heavy repairs to worn-out Lancashire and Cornish boilers and much more besides. Thirteen chapters setting out different jobs are explained and illustrated through 145 mono photographs which by and large produce well on the art paper. Many of the illustrations are from Alan’s collection of jobs being undertaken and these are nicely laced with photos from back in the day of mills, boilers and workers. Working with these hard drinking and chain-smoking men gave Alan lessons for life and experience to be master of his own boilermaking career, now carried on by his son following a well-earned retirement. 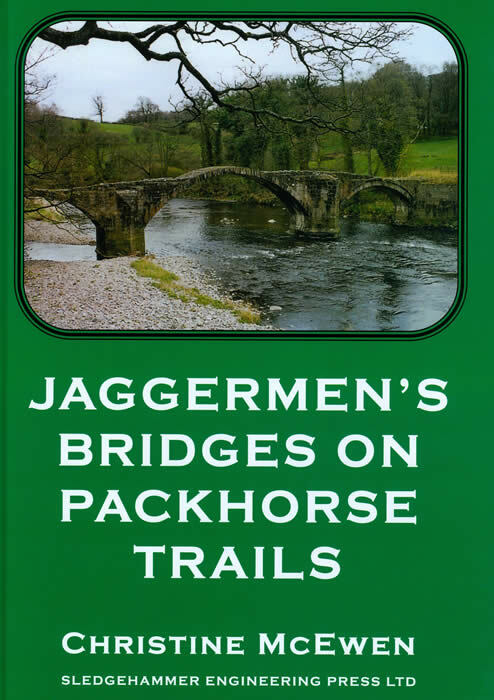 Be prepared to get your head around the ‘Lancashire Twang’ peppered throughout the book and you too will feel that you are really there amongst the heat, dust and enclosed spaces that was part of the everyday life … and not that long ago. Rivet Lad is an excellent read, full of characters, technical insights and stories of hard graft and engineering skill from the days of industrial steam power from one who was actually there. The Author spent his entire working life as a Boilermaker from apprentice and Rivet Lad, becoming expert and highly skilled in all aspects of boiler making and repair including coded welding, flanging, riveting and the design of repairs, boilers and pressure vessels. 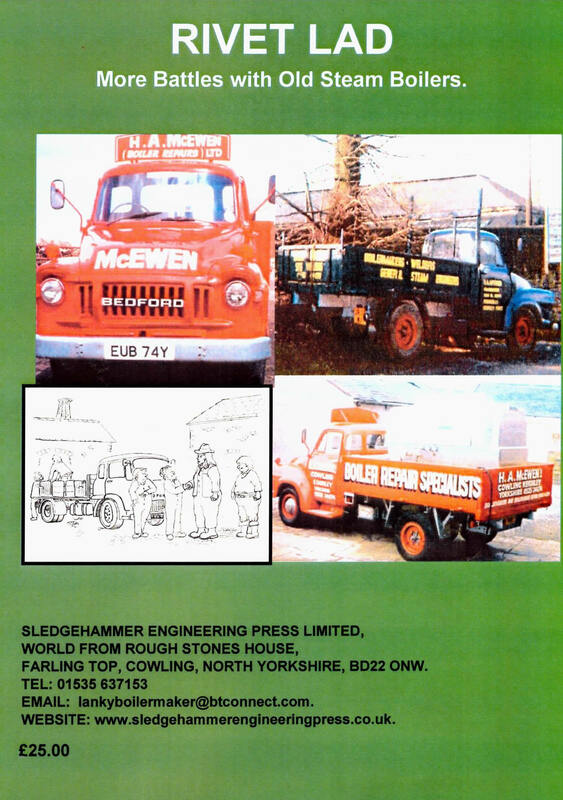 In 1968 he established his own firm, H.A McEwen (Boiler Repairs) Ltd, now run by his son. The business earned a well-deserved reputation for new and heritage steam work, including railway boilers to the exacting standards required for main line express locomotives. Alan McEwen speaks with authority, not only from direct personal experience of a full life in steam engineering, but also as a researcher into the methods, technologies, products and companies that made the steam age work. A great friend of like-minded steeplejack, Fred Dibnah, he shares his enthusiasm for his subject with similar gusto and has published countless articles for the technical Heritage press as a regular contributor to Old Glory magazine. His previous books are essential reading for those seriously interested in Industrial Heritage, ‘Fred Dibnah’s Chimney Drops’ and ‘Historic Steam Boiler Explosions’ are still in print, while ‘Chronicles of a Lancastrian Boilermaker’, his autobiography, is sold out. ‘Rivet Lad’ holds the attention on several levels. Most chapters present tales of a different job carried out in the challenging working environment that existed before the modern focus on corporate Health and Safety. In those days individuals had to look out for themselves and their mates in the squad while achieving tight completion deadlines. In his inimitable style the author not only describes the physicality of the work involved, the terrible conditions working inside the boilers, he also gives real insight into the lives of the tough yet diverse team of rough diamonds in which he was a key player. A team that had to closely knit together to make their living against the odds and fuelled it seems by gallons of Horniman’s tea. Related to each story are photographs and sketches of similar work actually being carried out – many with a youthful looking Alan doing the work. The text describes in some detail what actually had to be done to effect, the usually very heavy repairs needed to return large mill boilers and paper making or dye-works kiers back to safe working condition. Throughout, many reproductions are included from private collections of relevant illustrations and photographs. These provide a wonderful, pictorial, yet also technical context to the chapters and give a superb historical overview of the numerous Lancashire and Yorkshire boiler engineering works and their products. Rare pictures cover some of the works themselves, heavy haulage by road and rail, while sectional illustrations and photographs inside the boilers provide a boilermaker’s view of this important element of our heritage. The book deals with most of the important steam raising boiler types employed in our local industries. From Cornish boilers with Dolly Vardon steam receivers, through the massive ranks of Lancashire boilers powering the cotton, wool and paper industries, then vertical and locomotive boilers for lighter applications through to the development of high efficiency ‘economic’ boilers, ‘Rivet Lad’ illustrates a story of industrial power and human endeavour. Without the numerous engineering firms designing and manufacturing the plant and their countless highly skilled yet tough engineering squads that went out to regularly repair and maintain them, no steam driven mill or works enterprise would ever have succeeded. 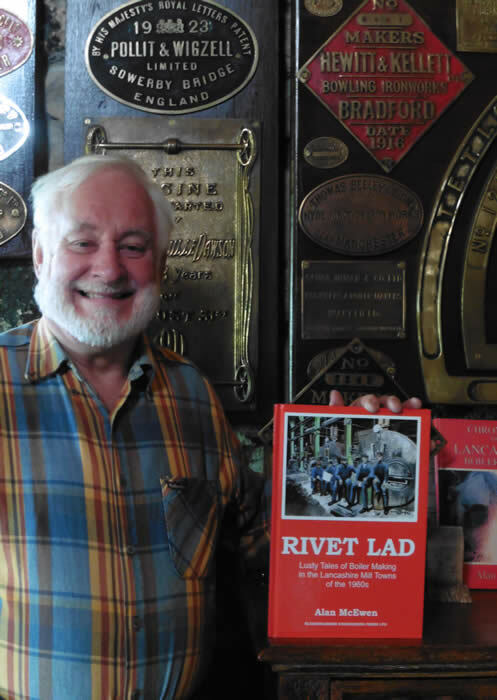 ‘Rivet Lad’ is not just about what these hard-working engineering tough guys had to do to earn their crust and keep our industries in production. It is also a rare source of historical material on a critically important part of our heritage about which little has been published to date. It provides valuable insights from an expert in the field for those of us responsible for historic steam plant – more essential reading! Anyone that has read any of Alan McEwen’s previous books will be familiar with his unique, easy going prose that never talks down to the reader but manages to put across his message in a such a way that whether he or she is an engineer of many years’ experience or simply someone with a passing interest in our industrial past, Alan always manages to hit the right level. There is always enough technical information to keep the interest without putting off the casual reader. This was very evident in his book ‘HISTORIC STEAM BOILER EXPLOSIONS’ and has been repeated again in his latest book ‘RIVET LAD Lusty Tales of Boiler Making in the Lancashire Mill Towns of the 1960s’. This latest book chronicles Alan’s early years as a newly qualified industrial boiler engineer working throughout the Mill Towns of Lancashire in the twilight years of Britain’s great Industrial Revolution when heavy industry was on the decline but where Mills and Dye Works still managed to survive, there were huge steam boilers that required maintenance and repair. Effortlessly, Alan manages to bring to life the characters he worked alongside such as the wonderfully named Carrot Crampthorn, Rueben Ramsbottom and Teddy Tulip! These were hard men that drank their beer by gallons, not pints, and always seemed to have a ‘tab’ (cigarette) in their mouths, but whose skills seemed to embody the sum knowledge of two hundred or so years of industrial boiler expertise. The work was hard, often carried out in dirty and cramped conditions but when a boiler required repair, there was no better group of men to carry out the work. Add to this the occasional saucy tale and you have a book like no other to convey the way of life of the heavy industrial boiler engineer. Alan’s book is a fabulous insight into a now largely forgotten world and I can thoroughly recommend it. Throw another log on the fire, draw your favourite armchair a little nearer the hearth and immerse yourself in an engaging first-hand narrative of a time that seems as though it belonged to the Victorian age and yet was barely 50 years ago. Upon reading retired Master Boilermaker Alan McEwen’s new book, “RIVET LAD-Lusty Tales of Boiler Making in the Lancashire Mill Towns of the 60s”, I was immediately transported back fifty seven years to a paper mill at Creech St Michael in Somerset where a fifteen year old boy was starting work for the first time as a rivet catcher in his father’s Boilermaking squad. The squad were there to carry out the renewal of severely wasted rivets in the furnace tubes on one of the mill’s Lancashire boilers. I clearly recall the Boiler Makers as being real characters just as Alan has described them. This book for me was a damn good read but, more than that it is an important work covering a significant part of the end of Britain’s industrial history and a “must read” on the bookshelves of any student of both the Industrial and Social History of Great Britain and Ireland. Alan McEwen, author and latter-day dealer in all things salvage and stoney at the World of Rough Stones, has written an autobiographical tome about his apprenticeship and rise to become one of Britain’s foremost steam boiler engineers. 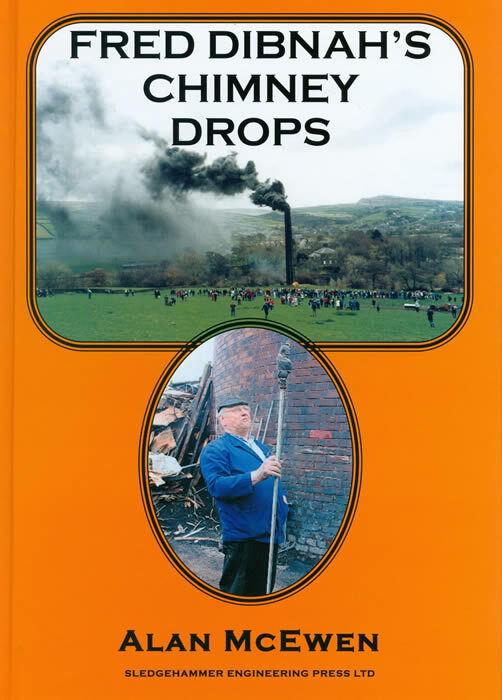 Entitled Rivet Lad, the book is published by SLEDGEHAMMER ENGINEERING PRESS LTD; as a sequel to two other recent classics by McEwen, about his friend the late Fred Dibnah’s chimney toppling exploits : FRED DIBNAH’S CHIMNEY DROPS, and the much sought-after HISTORIC STEAM BOILER EXPLOSIONS. Starting at 15 he was apprenticed in the early 1960s to Phoenix Boilermakers in Heywood*, a firm then employing 250 men, and became a member of Carrot Crampton’s boiler repair squad. Until the early 1970s virtually every northern industrial town would be home to one or more boiler shops. Different types of steam boilers are described – Galloway, Lancashire, Yorkshire, Spencer-Hopwood Vertical, Cornish, Egg-Ended plus the unusually-looking Kiers – and repairs to most are depicted in McEwen’s written vernacular, including x-rated ‘beddin’ of ‘bossomy’ ladies by Dermot ‘Paddy’ O’Boyle of Carrot Crampthorn’s repair squad into which the young McEwen was billeted. The book gets to the heart of the down-to-earth Boiler Makers following in the footsteps of men whose skill, tenacity, ingenuity, humour and bravery powered the industrial revolution by building and maintaining the mighty steam boilers which converted coal into usable energy, and which the author witnessed first- hand before the gradual demise of steam. Alan’s book, written in his own inimitable style takes the reader back to the exciting days of the 1960s when he was working on heavy structural repairs on Lancashire and Cornish Boilers, a Cochran Vertical Boiler, a Stationary Locomotive Boiler, a huge steam Accumulator converted from a Lancashire Boiler and much more.